The corporate media denounced the recent election in Venezuela in advance as “fraudulent” and a “sham”—not the elections in Honduras, Colombia, or Mexico, whose subservient governments joined with the United States in demanding that the Venezuelan elections not be held. Also at the instigation of the United States, the main opposition parties boycotted the election. This was after they had agreed a date for the election (22nd of April) at talks with the government held in the Dominican Republic. They had been demanding early elections up to then, and this had been the demand expressed by the violent and murderous campaign of last year. Why the boycott by the parties that had been clamouring for early elections, for the removal of President Maduro? The tactic had previously been advocated only by representatives of the extreme right, such as María Corina Machado and Leopoldo López, but, more importantly, it was also endorsed by the United States. An electoral victory would not suffice for them: they want to totally destroy the Chavista movement and restore Venezuela to the rule of the oligarchy and the United States. We saw what their programme is like during the coup d’état in 2002, when they abolished the constitution. When Richard Nixon set about removing Chile’s elected president Salvador Allende in 1973, he instructed Henry Kissinger to “make the economy scream.” The same strategy is being used today by Trump—following Obama. Venezuela was badly hit by the collapse in the price of oil. The economic sanctions imposed by the United States, slavishly followed by the EU and some Latin American states, along with the economic sabotage conducted by monopoly businesses in Venezuela, are inflicting great misery on the population. It cannot be said that Maduro’s government has put up a good defence of the “Bolivarian Revolution” initiated by Hugo Chávez. One of the major weaknesses of the process has been the failure to develop the economy outside the oil industry, and the fact that the bulk of the food has to be imported. Neither Chávez nor Maduro expropriated the wealth of the big bourgeoisie. For all the talk of “21st-century socialism,” the process has never challenged the economic power of the capitalist class. It has pursued social reforms, brought in a health service to poor districts where it had never existed before, likewise extended education to all. Above all it asserted the independence and sovereignty of the country. All this was achieved by a massive mobilisation of the working people, inevitably exciting the undying hatred of the old-established oligarchy and their imperialist allies. 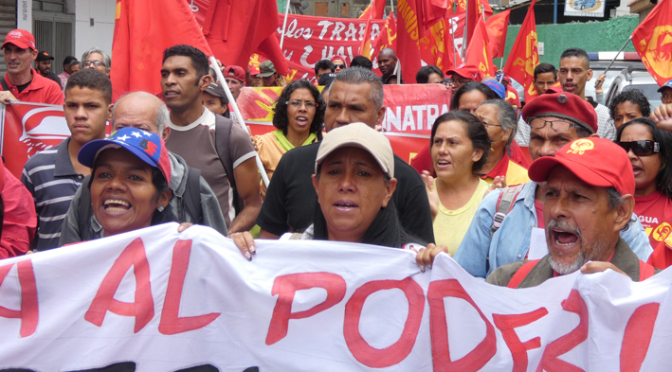 Since the death of Chávez the process appears to be going backwards in some respects. (An exception to this is the building programme, with nearly 2 million new homes built, much to the annoyance of the middle class, who see poor people moving into better accommodation than their own.) Rather than follow Chávez’s slogan of “deepening the revolution” and mobilising the working people, Maduro has been attempting to appease the opposition, holding talks with the business leaders responsible for creating the shortages, instead of jailing them. Worse, much of the organised hooliganism, known as the “guarimbas,” went unpunished, as were politicians openly inciting violence, such as Freddy Guevara. One who was jailed, Leopoldo López, was described in the corporate media as a political prisoner and a martyr for democracy. The weakness and prevarication of the government in the face of the economic crisis, the sabotage and the sanctions, have resulted in Maduro losing much of the enthusiastic popular support that Chávez enjoyed. There is also the growing influence of what has been called the “Bolivarian bourgeoisie,” who do very nicely from government contracts, public-private partnerships, and the like. In spite of a very good labour law, both they and government departments have been attacking workers’ rights. The Communist Party of Venezuela, the Fatherland for All party and other left forces have frequently been in conflict with the state. Together they formed the Anti-Fascist Anti-Imperialist Front, as the government party, the United Socialist Party of Venezuela, was putting no work into the Gran Polo Patriótico, which had been set up as a vehicle for left unity. Both parties hesitated before endorsing President Maduro’s candidacy. The mood of the people, and the popular disappointment with the government, was reflected in the low turn-out of 9 million voters—46 per cent—which is nevertheless quite high for Latin America. Maduro gained 6 million votes, against a little less than 2 million for Falcón. The result is a great escape for Venezuela and a massive defeat for the opposition and their imperialist backers. Even the fact that the election went ahead peacefully is a victory, as the opposition didn’t work up the energy to organise any serious disruption. But the imperialist threat remains. The United States is determined to break Venezuela, in order to reassert its dominance over the continent. It has been holding military exercises with Brazilian and Colombian forces on the Venezuelan border. Venezuela needs a more resolute defence, not by appeasement but by mobilising the people, by what Chávez called “deepening the revolution.” It also needs international solidarity.